Uniquely equipped for loopy comedy after sparring with William Shatner on ABC's Boston Legal, Emmy-winning James Spader will try to fill Steve Carell's dress shoes next season on NBC's The Office. 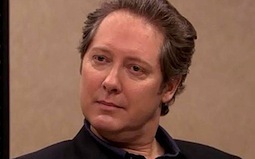 The network announced Wednesday that Spader will be a full-time cast member, reprising the Robert California character he introduced on the season finale of NBC's highest-rated comedy series. California's stepped-up title is CEO of Sabre, parent company of Dunder Mifflin. Paul Lieberstein, a co-executive producer of The Office, describes California as an "uber-salesman that has a power to convince and manipulate, like a high-class weirdo Jedi warrior." And Spader "has an energy that is completely his own, and The Office has no tools for dealing with him," Lieberstein adds in a publicity release. Spader won three Emmys as attorney Alan Shore, first on The Practice and then on its Boston Legal spin-off. ***CNN again is shuffling its prime-time deck, with CNBC import Erin Burnett getting her own show while Anderson Cooper does double duty. Ousted is former disgraced New York governor Eliot Spitzer, who first teamed with conservative Kathleen Parker last October on 7 p.m. (central) editions of Parker Spitzer. She left the show in February, with Spitzer continuing as the primary host of In the Arena. 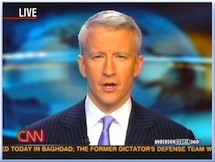 CNN controversially hired him after he resigned from office in the afterglow of a prostitution scandal. The new CNN lineup, effective August 8th, begins with Erin Burnett at 6 p.m. followed by live hours of Anderson Cooper 360 from 7 to 8 p.m. Piers Morgan Tonight remains in place at 8 p.m., followed by repeats of Cooper's show. Cooper also is launching a daytime talk show this fall, with WFAA8 planning to carry it at 3 p.m. weekdays in the Dallas-Fort Worth market. ***Kelli Giddish has a new NBC job after last season's cancellation of Chase, in which she played Texas-based U.S. Marshal Annie Frost. Giddish will be a series regular and yet-to-be-named detective on the Peacock's Law & Order: Special Victims Unit. The network also has signed Danny Pino (Cold Case) as a new gumshoe. SVU is losing longtime series regular Christopher Meloni while fellow co-star Mariska Hargitay will be leaving after the first 13 episodes of next season. Her possible replacement is rumored to be Jennifer Love Hewitt. Chase was filmed entirely in North Texas, but went down for the count along with two other area productions, Fox's The Good Guys and Lone Star.